Gooseneck Kettles - Why the Hype? #3 - Comfort. Yes, Comfort. THE VERDICT: Which is the Best Pour Over Coffee Kettle? Some believe that using a pour over coffee kettle is a waste of time and energy. A gimmick that makes you look more like a coffee hipster, rather than providing results. Those fools couldn’t be more wrong. But you can’t blame them; they aren’t serious about great tasting coffee. But you are. That’s why you’re here. You have a great coffee maker and now you want a gooseneck, but you’re having a hard time choosing one. I don’t blame you; there are dozens of them for sale online and the majority of them are a waste of money. Some of them lack pouring control, some of them burn your hand, and a surprising number of them leak strange and possibly toxic foreign chemicals into your brew. Here are the best gooseneck kettles of 2019. Choose one of these and you’ll know you didn’t just overpay for something that's going to ruin your coffee. This Pour Over Kettle By Coffee Gator Ticks ALL of the boxes + has a built-in thermometer and comes with a 100% money back guarantee (no other kettle offers this). Click the button to start brewing hipster level coffee with the Coffee Gator Gooseneck! Although it is entirely possible to make a delicious cup of coffee with a standard hot water kettle, having one can certainly up your game. There are many filter coffee recipes that require a near methodical attention to detail, like Blue Bottle’s Nel Drip. When it comes to mastering manual coffee over, even extraction is crucial, because it leads to improved flavor and aroma of your brew. A gooseneck kettle allows you to control where your hot water falls on your ground coffee, allowing you to more easily achieve a balanced saturation (better extraction). 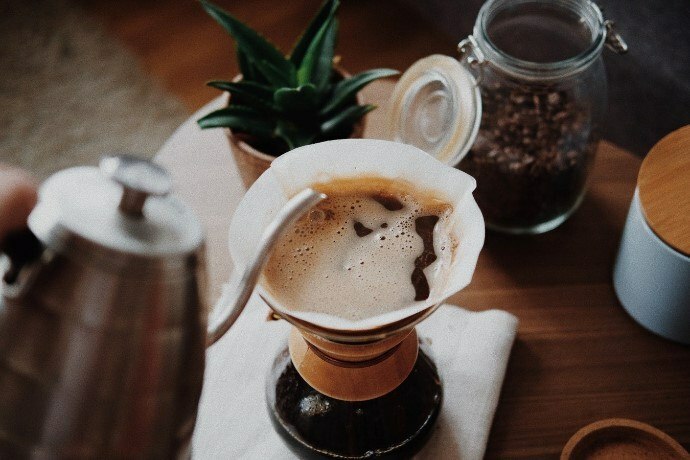 Let’s not forget: pour over brewing requires incremental pouring - some recipes even require you to meticulously regulate each pour by weight - and a gooseneck kettle makes it much easier to avoid the pain of under-pouring or over-pouring each round. Essentially, this type of kettle is for the barista what a fine-tipped brush is for the painter: a perfectionist’s tool. Given that these funky metal kettles are the tools of a connoisseur, it’s absolutely worthwhile to be a little persnickety. For this reason, I am going to touch on some of the fine details to pay attention to when shopping for your own pour over kettle. Some kettles pour slower than others, and some are more responsive to subtle shifts. Obviously, you want a gooseneck that doesn’t pour too fast, but speed is the lesser issue in comparison to consistency. Although a relatively quick pourer may take some practice to get used to, its purpose is wasted if it can’t pour evenly. The main goal with slow coffee - and likely the reason you are even looking into gooseneck kettles - is even extraction of your coffee beans’ flavor. A kettle that sloshes out the spout or drools at the beginning of a pour is going to ruin all that. The enemy here is rust, so try to avoid options built with inferior metals (although most of the options below use stainless steel, so you'll be good). Those cheap unknown brand kettles you may see on Amazon for very low price points often suffer from quick wear and tear as well as cracking along joints as they use inferior metals and too many plastic parts. AVOID. Keep in mind that you may be holding this kettle - over your brewer and out away from your body - for minutes at a time, gradually pouring in repeated increments. Therefore, it is important to make sure the kettle you purchase is comfortable to hold. Ironically, some kettles, in what seems like an attempt to keep up with fashion, have handles that feel more like an afterthought than anything else. Although comfort is a relatively subjective matter, a pretty handle isn’t so pretty when it’s awkward to hold while pouring or too hot to grip. Most goosenecks stick within the same maximum capacity range - somewhere around 1 liter. However, there are variations, and a few decimal places to the right or left can make a big difference, depending on how you brew. If, for example, you’re the barista of the family, a large size kettle will allow you to keep on brewing without constant refills of unheated water halting your stride. Since you’re here, reading these reviews of a (arguably) niche tool, I can safely assume that you appreciate maximizing utility. Luckily enough, there are numerous options out there to both satisfy your desire for a gooseneck kettle and your compulsion for efficiency. One 'make life easy' feature is the variable temperature kettle which allows variable temperature control: allowing you to set the exact temperature you’d like your water heated to. If you control the temperature of your water, your brew will taste noticeably better. Another add-on offered by some is a built-in temperature gauge. These normally take the form of a probe thermometer attached to the lid, and eliminate the need for post-boil countdowns. This is another way to breach the precise temperature required for amazing coffee. Here are 8 options that you can spend your money on without worrying whether you bought a dud. They allow you to control the rate of water flow, and in some cases, the temperature. Best of all, they will last for years as long as you use them how intended. The table summarizes each for the impatient among us, however, you can scroll below for more information. The Coffee Gator kettle may seem to be the perfect choice, and thousands of strong customer reviews online only confirm this. Here's why so many customers, including us, love this kettle: It has a built-in thermometer (no need to spend extra money on an external one). The gooseneck spout makes it easy to achieve the pour over coffee, and it comes with a strong 100% money back guarantee. What's not to love? My only objection: This little kettle (and I do mean little) is advertised to hold 1 liter, but the instructions state not to fill it much more than halfway. Not a problem unless you're brewing 3+ cups of pour over coffee at once. If you are someone who wants an all-in-one package deal, then the Coffee Gator may be good for you. Brushed stainless steel, funky design. Offers a 100% money-back guarantee (showing confidence in their product). Supposedly holds 1 liter, but instructions recommend you only fill the kettle 0.6L. Hmm. Chances are, if you order filter coffee at a coffee shop, you will see the barista using the Hario V60 Buono kettle. The Hario gooseneck kettle is trusted by professional baristas and at-home enthusiasts alike. Despite this devotion, the Buono doesn’t offer as much control over water flow as some other goosenecks. Finding the exact angle to achieve a slow, steady pour requires practice (but so does pour over coffee brewing in general). The Buono is a capable little dude, which holds a bit more water than others which would make it a good choice for someone who brews in large batches. Additionally, its beehive design nicely harmonizes with nearly all of Hario’s other coffee products, making it an attractive choice for the fashion-conscious as well. Design corresponds with other Hario products. The larger reservoir can hold up to 1.2 liters, much more than its competitors. The thin metal body tends to lose heat quicker than other goosenecks. The Bonavita Electric Gooseneck Kettle is comes with a make life easy feature: a 1000W electric quick heating function. This brings your hot water up to the perfect temperature, and keeps it there. The shut-off feature means you can set the temp and it will turn off once its achieved. Wow. Furthermore, the Bonavita offers impressive flow control. Water flows easily and predictably out the gooseneck spout, and the ergonomically designed handle, with its (brilliant) little finger notch, makes small adjustments a breeze. This kettle is a good fit for someone who highly prizes convenience and accuracy. It commonly agreed upon that its the best Chemex kettle. There are many temperature control kettles available online, but this one is the best electric kettle for manual coffee by far. Well-designed handle and spout is intuitive and easy to use. Includes an electric burner to heat your water quickly. Impressive flow control - perfect for trickier brewers like the Chemex. The best electric kettle for coffee. Ovalware’s Slow Dance gooseneck kettle is an impressive newcomer, and despite its relatively short time on the field, this kettle is making its mark on customers. It offers you an amazing degree of flow control, its angled spout allows hot water to flow smoothly, and the cleverly angled handle makes pouring much more convenient. The team behind the slow dance did their research very well. When compared to the Buono, the Slow Dance does have two drawbacks: a smaller reservoir and higher price. However, its sleek and elegant design wins it back some of those lost points. Funnily enough, it's also a popular tea kettle, so you can use it for a range of beverages. A slower and steadier flow rate allows for more predictable pouring. The nearly horizontal angled handle is both convenient and comfortable to use. Smaller reservoir than the Buono. Carrying on the theme of matching, Kalita, like Hario, also offers a gooseneck kettle to match its drippers. The Kalita Kettle has a stouter neck than most kettles, which makes for a stronger than average flow rate. If you’re used to a slower pour, getting used to the Kalita may be a bit tricky, yet it isn’t unconquerable. The Kalita kettle gives a very steady and predictable pour, and aiming - once you get your timing down - is relatively easy. In terms of design, the Wave Kettle scores high for its graceful styling and classic, wooden handles. Kalita's related products are renowned for being the best in the biz, and this kettle is no exception. Its classic stainless steel design makes for a stylish addition to your kitchen. 1 liter reservoir is sufficient for most purposes. Modern styling and a matte-black finish make the Fellow Stagg EKG Electric a natural choice for the kitchen fashionista. But the built-in variable-temperature controls appeal to the serious home barista as well. You can dial in the desired temperature, between 135 and 212 degrees F, and the EKG will hold your water at that precise temperature for up to an hour. Great for those times you're going to be making multiple carafes of pour over throughout the morning (or the evening). The temperature display shows your goal temperature as well as the current temperature, to give you something to look at while you're waiting for the water to boil. And there's even a built-in brew stopwatch to help you time your pour to the second. Matte black over stainless steel construction makes this gorgeous and long-lasting. Handle design helps with fine control during pour over. 1-liter reservoir is sufficient for most purposes. What's better than an electric kettle with 1-degree accuracy? An electric kettle that can be programmed to start automatically. The keep-warm feature will lock in the programmed temperature for up to an hour. So if you hit snooze a couple of times on your alarm, the Brewista will heat your water to the desired temperature, then hold it there till you make it into the kitchen. Lift-off base means no cords to complicate pouring. The Willow & Everett is a simple electric kettle that boils water quickly and shuts off automatically. Its 1000-watt element provides quick heating, but it lacks the temperature control offered by pricier gooseneck electric kettles on the list. The angle of the handle and the gooseneck spout make it comfortable and functional to use. And the mirror-finish stainless steel exterior gives it a different look from the usual brushed-stainless construction of so many kettles. Plus there's a spill-proof lid so you don't need to worry about water gushing out the top if you pour too quickly. Most impressively for this price point, you get stainless steel, automatic shut off, and the precise water flow you need from a gooseneck kettle. With this kettle, Coffee Gator seems to have taken notice of the flaws of other kettles and learned from their mistakes. It offers better control over flow rate than most other kettles, has a built-in thermometer, and they offer a 100% money back guarantee (when you buy via their website here). It’s official, according to Homegrounds, this is the best pour over coffee kettle. Runner up - The Slow Dance. Even though it's a little pricier than other gooseneck kettles, given its quality, I’d say it’s worth the price.